Reaction 7 formed in 2007 to develop and release a CD for distribution and airplay based on the psychotic song arrangement of Frank Fogg, the devious guitar voicings of Chuck Trimble and the mellow percussive tones of Michael F. Roberts. 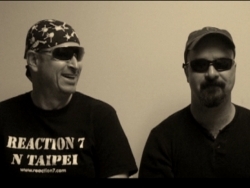 Other former members and contributors to Reaction 7 include Bobby Bodean Schroll on bass, Jackson Cesa on guitar, Erik Gerard on percussion and Alicia Fogg on vocals. The current Reaction 7 lineup features Frank Fogg on bass, guitars, keys, and vocals, Chuck Trimble on guitars, Alan Fishell on guitars, Chris Celleghin on percussion and Karen Baluch on vocals.